If there is one great thing about social networking, is the ability to build your brand through social marketing, directly and indirectly, which will help build name recognition. In the case of photography, name recognition is often associated with your photographic style, or identity. This recognition is very important in order to remain competitive and to gain attention to your photographic talent that can lead to a steady stream of clients coming to you for your shooting skills. Your photography identity grows only if you are proactive in it’s growth. Here I was featured in Leica World thanks to proaction not inaction. There is only one obstacle to gaining recognition of your photography and that is getting people to remember your brand, your name, and your photographic style. So how do we do this? For photographers, the first step is easy, just keep putting those copyright stamps on your photos, online and on actual prints you sell or giveaway, and if you’re photos are being published, make sure the publication gives you a “by-line” credit. Putting your name on your prints, either by copyright stamp, signature, or by-line credit, is extremely important for people’s memories of your abilities. People will forget you quickly if you don’t, and potential clients won’t know where to start if they are interested in working with you in the future. Psychologists have noted that “the average man” doesn’t use more than ten percent of their actual brain’s capacity for memory. Some psychologists, like noted Professor Carl Seashore, claim that 90-percent of the brain’s memory capacity is wasted because man “violates the natural laws of remembering.” These “natural laws of remembering,” which many “memory systems” rely upon, are impression, repetition and association. Here you can see my signature on the photo in the lower left, branding. I gave you the latter already, association—put your name somewhere on your photos, specifically those that are published, sold and/or given away to anyone, not just your clients. If you put photos on a blog, make sure they have a copyright stamp, logo or signature on them. And if you’re guest posting on someone else’s blog, make sure one of these identifiers is on the photo itself, and require the blog article to include your by-line credit in the photo caption or somewhere in the blog post itself. Whether it’s a blog, a television interview, a newspaper article, a magazine feature, an art gallery showing, or whatever, if your photos are placed where anyone can see them, you must have your name somewhere either on that photo or next to the photo. Make that a mandatory must for usage rights for anyone. Ideally, also put your website link. Perceptions are everything and a link to your website demonstrates your professionalism. Now let’s look at the next key, repetition. This one I know all too well as would any other military veteran—in the military, especially during boot camp or basic training, the drill sergeants are called just that, “drill” because they drill everything in your head, over and over through repetition. It doesn’t take a drill sergeant or the military to prove that learning, including memorizing things like tearing apart a weapon and putting it together blindfolded, comes with repetition—remember those psychologists? They’ve proven that already as well as successful orators and business people. In the case of my photography, it’s not uncommon that I will use one of my more iconic images in more than just one book, one promotion, one blog post, one Facebook or Twitter update, etc., as it’s those iconic images people remember. Many well-known photographers practice this, in fact, that’s why many of them are so well-known—for their iconic images. Let’s put this to a test using one of the most well-known artists, Leonardo da Vinci. You can’t use any reference material, you can’t ask for help, and absolutely no Google, memory only! What is his most famous first painting? Now if you said the Mona Lisa, you’re wrong, as his “first” painting that is considered by many as his most famous is The Last Supper. That’s actually a trick question as how can you say one painting is more famous than the other when art is subjective? However, I did say first and The Last Supper was painted in the 1490’s while the Mona Lisa was painted in the early 1500’s. Providing you with an image of the Mona Lisa before I asked the question probably didn’t help you either. But what if I had placed an image of a tree before the question instead of one of Leonardo’s paintings? 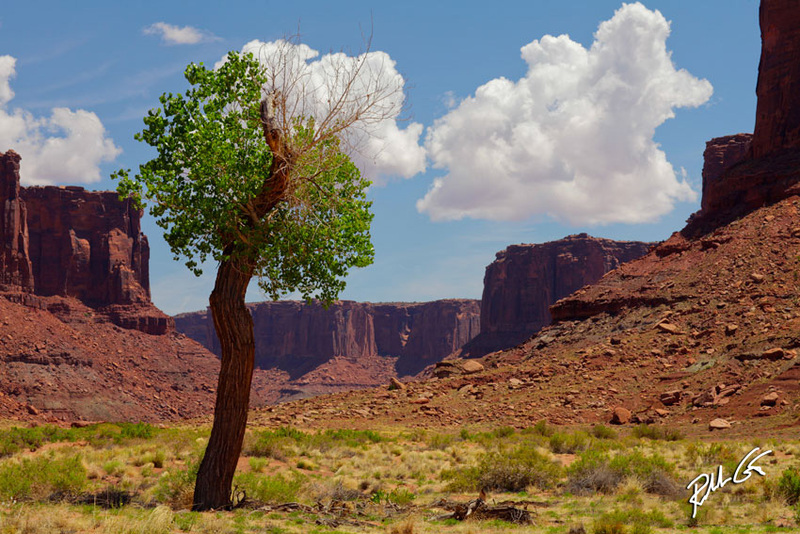 I’ve driven by this tree many times over the years when I conduct photo workshops in Moab and finally one of my models noticed it and asked me to stop so she could photograph it, of course I did too. Now let’s take Edison’s reasoning and add the association key to it and of course, we’ll have to assume the results, but I’m pretty sure we can all agree on this assumption. Let’s pretend we make a cold call upon Mr. Edison. He tells us the cherry tree story. So, we make a $20 bet with him that we can get all 27 of his assistants to notice that tree the very next day. So, pretending again, Edison accepts the $20 bet with a gentleman’s handshake. We then act on the “association natural rule of memory” and place one of our best photos, in my case one of a beautiful glamour model, enlarged to an 11 x 14-inch print, frame it, then place it on an easel leaning against the cherry tree. Do you think people will notice the cherry tree now? Maybe, maybe not, but perhaps if you put a nice title on a shiny, but pretty brass plaque directly on top of the photo and with the words, “Cherry Tree” inscribed on it, they would not only notice it, but appreciate the beauty of the cherry tree blossoms. This is one of my newest iconic images that will showcase my photographic style. Chances are high that you’ll probably sell that image to your customer if you can convince him or her to place that photo next to something they wanted their customers to remember. Convince your customer that now their customers would remember because of association—just remind your client of Thomas Edison and the cherry tree. Cha-ching, instant sale! Now while you may have made an impression, yes, the final natural law of remembering, on that customer, how do you make impressions in general to other potential customers, especially those that don’t meet with you at first personally, but find you online instead? First, you have to have a strong website, a professional looking website, not a portfolio online on some free website that allows you to showcase your work—though you should be there too—think repetition. With a strong website comes a social presence by maintaining a strong social media network. As a minimum, you should have some sort of social presence on Twitter and Facebook. But don’t just open social media accounts and constantly tweet or update your status messages with self-serving statements. Provide reasons for people, your followers or fans, to come back over and over again. One of the keys of a successful social presence is providing pertinent information for your platform along with engaging with your followers. This helps build brand awareness which strengthens your identity and quite possibly will increase the traffic to your professional website. The top professional photographers, many who were “unknowns” before there were any social-media channels, are where they are today because they recognized the power of social media early on—though it’s never too late to start. While some photographers have the early adopter edge, new stars rise daily because people are hungry for new and daring talents. As an early-adopter of the Internet and the World Wide Web in 1998 I stated, “The Internet is the great equalizer.” I still stand by that statement today. While cherry trees might not be important to you or others, the fruit those trees bear are sought after many, world-wide, and if you’ve ever purchased a bag of fresh cherries, you know they come at a cost, often higher than most other fruits. Think of your photography as the fruit of your passion plus labor, and if you produce great photos that leave an impression, repetitively, people will associate your photography style with your brand.